DUBAI ? The Boudthib Endurance Village, Al Khatem, Abu Dhabi, will play host to three endurance rides tomorrow. The rides are organised by the UAE Equestrian and Racing Federation. As many as 25 endurance riders are likely to participate in the 100km, CEI, two-star Boudthib Endurance Cup for Young and Junior Riders. The ride will be run in four loops of 30km, 30km, 24km and 16km respectively. Pre-ride inspection will be held on the same day from 5am to 6am and the ride is expected to be flagged off at 6.30am. There will also be a Best Conditioned Horse competition. Sixty four riders will be taking part in the 76km Federation Qualification Ride which will be run in three phases of 30km, 30km, and 16km respectively. Pre-ride inspection for this qualifier will also be held on the same day at 5am and the ride will begin at 7am. The day will also feature a 46km Federation Qualifier for which 76 riders have confirmed their participation. The ride will be run in two stages of 30km and 16km respectively. With the pre-ride inspection scheduled to be held at 5am, this second qualifier will be flagged off at 7.30am. The Federation organises qualifiers at regular intervals to help riders and horses to qualify themselves to ride in higher category rides. The Boudthib Endurance Village, which is part of the Emirates Heritage Club, is the second endurance village in Abu Dhabi and the third in the UAE. The Emirates Heritage Club is closely involved in the development of several traditional and cultural activities and sports in the country, including endurance riding. The club also provides vital training facilities for children in the UAE and the opening of its modern and excellently planned endurance village is being welcomed by the equestrian fraternity as an important step in the development and teaching of endurance riding in the UAE. THE newly-built Endurance Village is ready as of this minute to host any top endurance event, declared World Junior Endurance Championship director and Bahrain Royal Equestrian and Endurance Federation's national teams manager Shaikh Daij bin Salman Al Khalifa. This top-level event will be held in the Kingdom for the first time from December 15 to 18. Shaikh Daij said the village is equipped with world class facilities, including state of the art stables, veterinary rooms and all other related items for hosting such a prestigous event. Shaikh Daij tipped the UAE riders as favourites to steal the show due to their vast experience in this sport. Shaikh Daij thanked the organising committee chairman and General Organisation for Youth and Sports president Shaikh Fawaz bin Mohammed Al Khalifa for his continuous efforts in following up the organisation procedures and preparations. Blue Grass Horse Feeds is proud to announce its sponsorship of the Irish Young Riders team at the World Endurance Championships in Bahrain. The championships, which will be held on 17th December, are a true test of endurance for horse and rider. The Irish Young Riders team is made up of three 19 year olds - Emily Miller riding DVS Tahini, a 12-year -old Trotter X, Dawn Leadon-Bolger riding Damascus D?azat an 8-year-old pure bred Arab, and Philip Giles riding Millers Light, a 10 year old Irish Sport Horse. SHAIKH Faisal bin Rashid Al Khalifa of Al Talia Stable and Abdulla Al Khatiri of Al Showamek Stable clinched the 100-km senior and junior races respectively in the Season Opening Endurance Championship, organised by the Bahrain Royal Equestrian and Endurance Federation (Breef), yesterday at the Endurance Village premises in Sakhir. Riding Chesterfield, Al Talia Stable captain Shaikh Faisal, who is also the Breef endurance committee head, proved too good in the Al Khaldiah Stable-sponsored event to finish first among 36 riders in five hours, 13 minutes and 40 seconds. The race was divided into four stages with 30 kms each for the first two stages, 25 kms for the third and 15 kms for the fourth. The battle for the senior race and the main prizemoney of BD1,000 was very close as Jabur Al Dossary, also of Al Talia Stable and on Lorraine, was pipped to second place by just three seconds. Yousef Taher (5:26:12) of the Royal Endurance Team on Jamil finished third and was followed by French rider Jean Marie Oliver (5:45:24) of the Royal Endurance Team. In the junior section, Al Asayel Stable's rider Abdulla, on Nakeer, bagged the biggest prize of BD700 beating 17 entrants in five hours, 32 minutes and 55 seconds. Behind him was Mohammed Al Thawadi (5:38:04), on Fasheera, of Al Asayel Stable in second place. Third was Ahmed Abdulaziz (6:10:24), on Saham, of Al Salam Riding School while Royal Endurance Team's Mohammed Abdulaziz (5:38:04) came fourth on Muniki. Breef acting president Shaikh Khalid bin Hamad Al Khalifa, who took part in the senior race, was forced to quit during the third stage following an injury to his horse Tawmarsh Tamrisk. Two qualifying races, over 85 kms and 60 kms, were also held with 10 riders taking part in each event as part of a warmup for the forthcoming season. Shaikh Khalid honoured the winners of the seniors race while General Organisation for Youth and Sports president Shaikh Fawaz bin Hamad Al Khalifa presented the awards to the junior race winners at the awarding ceremony in presence of Breef members and other officials. Meanwhile, the remaining local endurance races will be taking place after the World Junior Endurance Championship to be held in the Kingdom from December 15 to 18. ABU DHABI ? The new UAE Equestrian Endurance season kicks off with today?s Al Wathba Cup here at the refurbished Emirates International Endurance Village at Al Wathba. Start time at 6.30am. The curtain-raiser event includes the main Open race over 120-km, enjoying three-star status and has drawn 90 entries, and worked off alongside the main event is the 100km ride two-star for Juniors and Young Riders. General Shaikh Mohammed bin Rashid Al Maktoum, Crown Prince of Dubai and UAE Minister of Defence, and his wife Princess Haya bint Hussain are among the leading entries for the main race. General Shaikh Mohammed?s sons, Shaikh Hamdan and Shaikh Ahmed, two of the established riders in the international stage, are among the favourites in the field that has drawn all the leading national and expatriate riders from all over the Emirates. General Shaikh Mohammed is likely to be onboard Rafali (Stormy Petrel), an 11-year-old bay gelding whilst Princess Haya is set to ride Rabdaane, a 14-year-old chestnut gelding. Shaikh Hamdan will be astride seven-year-old grey gelding Kamel Armor. The main race will be run over five loops of 32km, 30km, 24km, 18km and 16km, and the ride for Young Riders and Junior over four loops, 32km, 30km, 24km and 16km, and serves as the first of the two trials for the FEI World Endurance Championship for Junior and Young Riders in Bahrain on December 17. According to the Endurance Department of the UAE Equestrian and Racing Federation, the Emirates International Endurance Village will stage six races including the prestigious President?s Cup over 160km on February 16. The Dubai Endurance City will stage seven rides and six races scheduled at the Boudthib Village in Abu Dhabi. The opening ride here at Al Wathba will be followed by the National Day Cup on December 15, Al Wathba trophy on January 19, the President?s Cup, the Emirates Challenge on March 9 and the Shaikh Rashid bin Hamdan Al Maktoum Challenge second round to complete the Abu Dhabi fixtures. The Dubai Endurance City will stage their first ride on December 24 and will hold two races each in the next three months. The races are scheduled for December 8 and 22, the first round of the Shaikh Rashid bin Hamdan Challenge, a couple of races on January 12 and 26 (Shaikh Saeed bin Hamdan Al Maktoum Challenge), the Shaikh Maktoum bin Hamdan Al Maktoum Challenge on February 9 and the final fixture of the Dubai schedule on February 23. Boudthib kicks off with the 100km race for Junior and Young Riders on November 27 and will be the venue for two rides in the following week on December 4, both an open race over 100km and another over the same distance for Juniors and Young Riders. Lexington, KY ? Ashlee Van Raalte, 18, of Scales Mound, Illinois, will represent the United States in Bahrain, December 15-18, as she rides for the title at the 2005 FEI World Endurance Championships for Juniors and Young Riders. The 2005 Championship promises to be the largest competition of its kind to date, and will play host to more than 150 expected entries from a record 33 participating countries. Van Raalte will compete on the 75-mile course with either ?Saif Al Arab? or ?Aliya,? both owned by Sheikha Madiya Al Maktoum of the United Arab Emirates. One hundred miles is a long trek by any standards, but to guide a horse over challenging terrain day and night for 100 miles requires endurance. And that's exactly what an 18-year-old Arabian named Phoenix Affair and his 23-year-old rider showed in spades at the North American Endurance Championships in Fair Hill, Md. Phoenix was the oldest horse to place in the October event, and Napan Lindsay Graham was the youngest rider. Veteran endurance rider Karen Kroon didn?t consider herself primed to win the Individual Gold medal at the 2005 FEI North American Endurance Championship (NAEC), but she did it anyway, thanks to her horse and her crew. Ten months ago, Kroon, of Cheyenne, WY, was a long way from home, and the thought of competing at the NAEC was equally distant in her mind. While other riders were preparing for the NAEC, Kroon, a public health officer for the Air Force, was in Iraq, where she had been on active duty since January, while her horse Rokket stood idle in Maree McAteer?s pasture in Colorado. Kroon was still in Iraq when longtime friend and Mountain time zone team chef d?equipe Holly Ulyate of Larkspur, CO, corresponded with her about nominating for the team. ?I knew if she got back [in May] she could get Rokket ready by October,? said Ulyate. Kroon agreed. However, by the time she returned from Iraq, Rokket hadn?t competed since winning and earning the best condition award at the 2004 Arabian Nights 100-mile ride in August, in a blazing time of 7:57 for his first 100-mile. ?I knew he was strong going into that ride,? Kroon recalled, ?and I was fairly fit, so I thought he would do well. He sailed through every vet check and just kept going. Everything went perfectly, and the horse looked like a million bucks at the end of the ride.? Despite the long lay-off, Kroon felt that her horse was actually in better condition this summer than she was. During the five months overseas, Kroon had lost much of her endurance riding fitness and gained about 30 pounds that Rokket would have to carry. This worried her. In preparation for her demonstration ride, Kroon took the 11-year-old gelding to two 50-mile rides in July and August, winning and earning best condition at both, before returning to the Arabian Nights ride for her demonstration and first FEI ride. ?As it turned out, he wasn?t in that bad of shape, but I still wasn?t in as good a shape as I had been the previous year.? The duo finished third in 9:22. ?I didn?t feel like it was his best ride, because of me,? she admitted. "Also, it was rockier than last year, and he got a little sore, so I backed off toward the end to make sure we finished.? Five weeks later, Kroon and Rokket made the 36-hour trip to Maryland. A record to be proud of, Kroon is no stranger to competition and winning. The veteran endurance rider has logged 10,150 American Endurance Ride Conference (AERC) miles since competing in her first ride in 1977 as a teenager. She won her first 100-mile ride, the Big Horn 100, in 1981, with Wizard, a Witez 11 grandson and her first horse. In 1983, Wizard started and finished 13 rides with 13 wins and 12 best condition awards. Since 1985, when the AERC began archiving individual ride results, Kroon has started and completed 23 100-mile rides, finishing all but one in the top 10, and earning 12 wins and 12 best condition awards. Also since 1985, she has logged 116 completions in 120 starts, with 72 wins and 56 best condition awards. In 1997, she earned the National Best Condition Championship with Gonzin. Kroon purchased Rokket as a five-year-old from Jay Mero in New York. ? [Jay] had him advertised in Endurance News, and I really liked his breeding,? she said of the half-Polish, half Rushcreek-bred horse. She started competing on Rokket in 2001 and has accumulated 865 AERC miles, with 16 starts, 15 completions, eight wins and seven best condition awards. She described the stocky, 15.1-hand gelding as an easy keeper. ?He likes the vet checks because he really likes to eat, but he also likes to get back out on the trail," she said. Once in Maryland, Kroon worried a lot. ?I was concerned about the footing because it was raining; and my horse had to stay in a stall, which he hated,? she said. ?I tried to pre-ride the last loop on Thursday and got hopelessly lost. That got me worried, too, as I have a reputation for getting lost.? At the pre-ride briefing, Kroon's mind eased somewhat when she learned that the last loop she had tried to follow hadn?t been marked yet, and wouldn?t be until ride day. ?Ride management did an excellent job,? she later commented. ?The trail had to be the hardest trail to mark that I have ever seen. I think there were a hundred miles of ribbons out there.? Management also had concerns about the trail prior to race day. ?We were worried about the footing,? said Ground Jury President Mike Tomlinson, DVM. ?We had alternative plans if the footing got bad, but as it turned out, the trail master got the trail to be safe. It was technically challenging, but safe. It was also marked well." For the ride, Kroon didn?t have a specific strategy. ?I knew my horse was really good and so I figured I would ride him at a good pace and see what happened.? When she left the first vet check, there were no more than six riders ahead of her. By the second vet check, she was within two minutes of the leading group. At about the 40-mile mark, she and teammate Tracy Webb took the lead. ?Tracy wanted to back off, so we went pretty slowly,? recounted Kroon. ?Shortly thereafter, we got caught by a big group of riders. At that stage in the game, I hadn?t wanted to go any faster, as there wasn?t anyone ahead of us, so [Rokket] got a little bit of a rest," she said. Kroon was somewhat critical of Rokket?s recoveries at the vet checks. ?His recoveries were not what I usually expect from him. He got a little hot, and he?s not used to having so many people around him. But most of [his recoveries] were around five minutes,? she said, adding that his CRIs were good throughout the day, even dropping at the finish check. Halfway through the ride, she and Dominnique Freeman, riding Stagg and Cheryl Newman?s Jayel Super, paired up and eventually took the lead. Freeman lives in La Honda, CA, but was riding for Great Britain. ? [Ride management] had a really nice finish,? said Kroon. ?We turned up the last three-quarters of a mile. It was a nice grassy uphill and Dom and I galloped that pretty fast, but under control. Then we had a sharp turn to make onto the track. After we made that turn, I let Rokket go and Dom chose not to race me. Earlier, Dom asked me what I wanted to do at the finish, and I told her I couldn?t answer that until I knew what was going on with the team. If we?d still had a team in, I probably would not have raced in.? "Rokket galloped to the finish with his head in the air and his tail up over his back,? Kroon described. Their winning time was 11:45. She admitted that it was a nice feeling to win. As much as she would like to nominate to compete at the next world endurance championship, Karen said that her duties with the Air Force make it difficult to make the commitment at this time. THE International Equestrian Federation (FEI) approved the programmes of the World Junior Endurance Championship to be held in Bahrain from December 15 to 17 at the Endurance Village premises in Sakhir. The first day will feature a number of official meetings and will be followed by an opening ceremony and a dinner banquet in honour of the participanting countries. The second day will include veterinary tests and a meeting during which participants will be briefed about the race rules, regulations and route. The actual race will be held on the third day. The race will consist of five stages with the first two stages over 30 kms each while the third stage will be held over 25 kms. The fourth stage will be over 20 kms and the fifth and final stage 15 kms. Meanwhile, committee chairman and General Organisation for Youth and Sports president Shaikh Fawaz bin Mohammed Al Khalifa met FEI Endurance Committee chairman Ian Williams and reviewed the preparations being made for the success of the event. Williams, who visited the village and inspected its facilities, said he was pleased with the upgrades made to the venue and praised the efforts of the organisers. Bahrain Team riders at the Recent Trans Tasman Challenge (l to r) Sasha Laws-King , Brooke Warner , Amily Daw , Kristie McGaffin. Winners of the First Endurance Ride of the 2005-06 season, seen with HE Sheikh Mohammed bin Hamad Al Thani, Chairman, Qatar Endurance Committee, and HE Dr Sultan bin Hasan Al Dosari, Minister of Municipal Affairs & Agriculture. DOHA: Saud Jaber Al Saaq rode his Anglo-Arab horse Bahar to a superb victory in the first Endurance Ride of the 2005-06 season in Mesaieed on Saturday night. HE Sheikh Mohammed bin Hamad Al Thani, Chairman, Qatar Endurance Committee, and HE Dr Sultan bin Hasan Al Dosari, Minister of Municipal Affairs & Agriculture, under whose patronage the First Ride was held, attended the race. The 100km race was held at the Sealine area in four stages ? the first two restricted to 30km each and the last two to 20km each with an optional pause of 20 minutes between the legs. The race carried a total prize money of QR 300,000. Hadi Nasser Al Ramazani piloted his Pure-Arabian chestnut Akh Tut to the second place while Hassan Salman Ridah rode Bashan Silver Shadow to the third place. The 80km ride for youth was won by Khalid Mohammed Al Ali, who rode Bahij to victory and was followed by Mohammed Harban Al Mass on Vakil Ibn Nefous. Mansoor Khalil Al Mansoori, on Mesafir Al Shaqab, finished third. Open Race on Dec. 3: 120km (QR350,000); 100km for youth (QR170,000), 60km for juniors (QR5,000). Open Race on Jan. 7: 100km (300,000); 60km for juniors (QR5,000). GCC Endurance Championship on Jan 28: 120km (QR500,000), 100km for youth (QR200,000). Qatar International Endurance Race on Feb 26: 120km (QR500,000), 100km for youth (QR300,000). Local Endurance, March 17 and 18: 160km (QR450,000). FIFTY portable stables arrived from Dubai as a supportive gesture for the 120-km World Endurance Championship for Juniors and Youth to be held in Bahrain commencing on December 15. This was announced by Bahrain Royal Equestrian and Endurance Federation second vice-president Shaikh Khalid bin Abdulla Al Khalifa after the organising committee meeting at the National Stadium's conference hall. Shaikh Khalid said the stables were sent by Dubai's Endurance Office and delivered at the Endurance Village premises in Sakhir where the event will take place. Shaikh Khalid said the committee confirmed the schedule of the opening ceremony which includes a song by popular singer Rashid Al Majid, fireworks and an open local market. The committee also approved the accommodations for the judges, technicians, veterinarians, media and other invited guests following a report submitted by accommodation and transportation committee head Abduljalil Assad. The event will be held over four days with the race scheduled on December 17 and will be divided into five stages. The meeting was also attended by tournament director Shaikh Daij bin Salman Al Khalifa and members Shaikh Mohammed bin Ebrahim Al Khalifa, Tawfeeq Salehi, Dr Khalid Ahmed, Rashid Al Shaikh, Aref Al Mansoori, Mahmood Bodrees, Fahad Al Rumaihi, Mahmood Abdulsaheb and Hana Al Askari. The Lake Oroville Mounted Assistance Unit (MAU) staged another successful Lake Oroville Vista Endurance (L.O.V.E.) ride on November 5, with 143 horseback riders from all over the state, also including some from as far north as Oregon and Canada, who began either an early morning 30- mile or a 50-mile trek around and through the foothills above Lake Oroville and back again. Originally we were told there were 72 50-milers and 50 30-milers. Chairwoman Kathy Papa and her able crew of 120 volunteers and committee persons ensured the event went well and safely for all involved, after which a barbecued dinner was served before prizes were awarded. Pictured are only a few of the committee, including Alyssa Agee (11 years old), Casey Jones, Tina Sorenson, Kathy Papa, Nancy Weinzinger and Jill Farris. Mother Nature was very kind in giving everyone pleasant and clear weather, just two days before her rains fell. As a result, many enthusiastically told us they would be sure to return next year. Twenty eight of the 120 volunteers were from the Auburn area and were operating portable radios for rider safety. Oroville's Dr. Roy Shannon organized the pulse and respiration services, as well as supplying the catered food offered at the halfway point at the Loafer Creek Horse Camp. And Raley's Market came up with apples and carrots for the horses to enjoy. For the fifty milers, Kassandra DiMaggio of Greenville, riding Buck Mt. Wind Prince had the winning time, and Michaela Anderson (12) of Oroville, atop CRM Xpressions was the leading junior rider. Kathie Perry on ARR Heartbreak won for Best Conditioned Horse. Deanna Guinasso of Redding, riding RGK Flashfire, had the best time for the 30-mile competition, and Colton Deaver (11), also of Redding, and riding Kceko, was the best junior entrant. Renie Burnett won for Best Conditioned Horse, and Cathy Kneupef of Alturas took the Good Samaritan Award. The awards for youngest riders went to seven-year-old cousins Mariah Lynch of Chico and Tristan Barger of Anderson. We didn't witness any awards for oldest entrants, although some appeared to be seasoned veterans. Aunna Lisa Wood will turn 16 in February. Unlike most teens, though, she's not very concerned about when she will get her driver's license and a car. "Mom says if the gas prices keep going up, I might just have to ride my pony to school," said Aunna Lisa, a sophomore at Cornerstone Christian Academy. "I tell her that I wouldn't mind that at all. My school is in Shelbyville, but I know we could make it." Golden's Cindy Penno has owned, trained and shown horses for a number of years. But nothing in her previous experiences quite prepared her for her latest venture. Penno, along with local veterinarian Michael Peterson, is coming off a season where they became heavily involved in the relatively obscure sport of endurance riding. 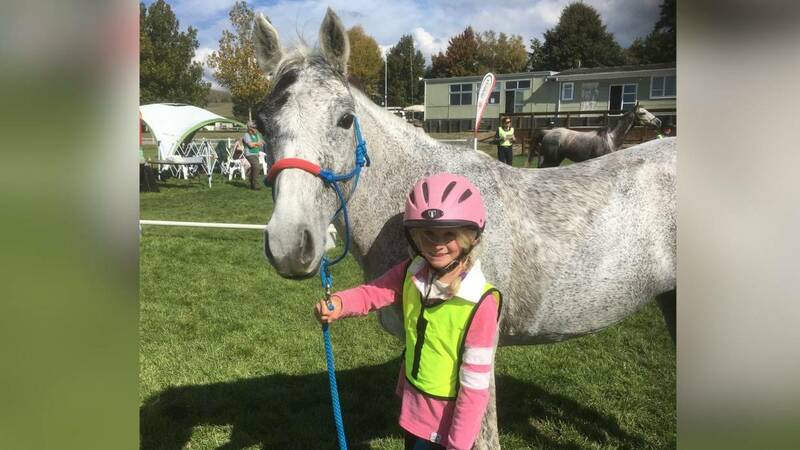 Endurance riding, as defined by the American Endurance Ride Conference (AERC), is an athletic event with the same horse and rider covering a measured course within a specified maximum time. Penno says she and Peterson became interested last spring after he received a memo from the Endurance Ride B.C. (ERBC) group in Kelowna, regarding a clinic they were putting on to encourage more veterinarians to participate in the sport. "Because he [Peterson] was interested in continuing education, and we both have a similar interest in horses, we thought: 'What the heck - let's go down there'," says Penno. It was the start of a busy season that saw both attend a host of competitive events throughout B.C. In total, Penno says she logged 112 competitive miles of rides during four events - her first one in Summerland last May. Penno used two of her horses during the season but recently purchased another that she will ride for the next one. Her new horse, Ali, is a nine-year-old Arabian gelding - an experienced endurance horse with 960 competitive miles already under his saddle. Peterson became a valuable contributor to ERBC events and ended up working five of the eight B.C. races. He recently returned from a prestigious endurance race event in Boise, Idaho where he served as head veterinarian. "The motto in the sport is: 'To finish is to win'," says Penno. "The horse needs to be fit to continue and that is the biggest challenge - doing the race with a horse that is sound and healthy and has energy left to go." Penno explained that races vary in length from 25 to 100 miles and that there are a variety of ways the track can be set up. "Most of the rides I've been on have been done in what they call 'loops'," she says. "You are given a map and you follow these marked trails." As the sport does demand a lot from both rider and horse, the main focus is on the well-being of the animals. "It is not on the rider, it's totally on the horse," says Penno. She explains that the horses are stopped throughout a race and given a thorough check-up by the attending veterinarian before being allowed to continue. The number of stops is dictated by the length of the race. Penno is now looking forward to next season and conquering many miles with her new competitive horse - the aptly-named Ali. Ulster rider Philip Giles from Donaghadee recently won the title Irish National Endurance Champion on his 2* horse Bridgewater Vicki, beating last year's winner by over 10 minutes. Terri Moore from Wicklow defending her title riding Galeshill Boffin, made a sustained and valiant attempt but was unable to meet the challenge set by Philip on the last 10 miles stage of the race and had to settle for second place. The riders set out from Tullybrannigan at 8am and headed up into Tollymore Forest. After completing around eight miles around the forest tracks they headed across country over fields, tracks and bridle paths for Castlewellan Forest, returning to Tollymore and Tullybrannigan having completed the first 25 miles of the 50 miles race at a steady pace of just over 16k per hour. Philip was first to call time for the vet in just over three minutes from arrival, his horse vetting successfully with heart rates, well below the maximum 64bpm, a theme set to continue throughout the day. The second loop took the riders in the opposite direction down around Donard Wood across to Tollymore and back to Tullybrannigan, a distance of approximately 15 miles. The riders still only minutes apart remained in sight of each other throughout this loop returning to the venue together. Once again the speed of vetting gained Philip those extra precious minutes allowing him to set his challenge in the final loop. At the second vet gate the horses were rested for 30 minutes before a compulsory veterinary representation and departure on their final leg of the race. Philip was off first with a four minute lead over Terri. He cantered up the steep incline out of the venue towards Tollymore Forest just taking time to glance over his shoulder before disappearing out of sight and setting a blistering pace of over 19kph, returning to the finish line from Tipperary Wood just 50 minutes later and putting another six minutes between himself and second place. Terri immediately rose to the challenge and was unrelenting in her effort to catch him right to the line but unfortunately for her was unable to make any impression on his lead. Third place went to another young rider George Finlay also from Co Wicklow who had been a contender for the title earlier in the day during the first two stages of the race but was unable to keep up the momentum on the final stage. Philip has had a very successful 2005 season crossing the line in first position on three occasions and twice in second out of six starts. However, his season is not yet over as later this year Philip will be representing Ireland at the Young Rider World Championships in Bahrain on 1December 17, and is now concentrating his efforts on the final preparations of his 3* horse Millers Light.